An understanding of the earliest composition of the solar system is derived from analyses of the Sun, comets, and the little-altered carbonaceous chondrites . Most of these measurements have come from analyzing the spectra of light that originates from the Sun or that is reflected by bodies such as comets and asteroids , the presumed source of most meteorites . Many chemical analyses of meteorites have been made in laboratories on Earth and, increasingly, from spacecraft that encounter comets, asteroids, and the Sun's atmosphere. 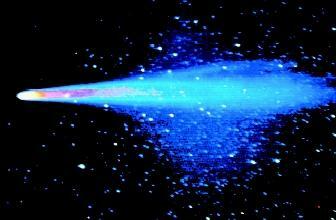 Comets comprise a huge reservoir of water in Earth's solar system. Shown here is Halley's Comet, which crossed Earth's orbit in 1986 but was barely visible to the naked eye in much of the world. Because the great mass of matter in the solar system (nearly 99.9 percent) resides in the Sun, solar hydrogen (H), oxygen (O), and the water molecule (H 2 0) must be considered when discussing extraterrestrial water. The Sun, with an average surface temperature of about 6,000 kelvin (approximately 5,727°C or 10,340°F), would seem to be a poor place to look for water. However, scientists know that the constituents of water are enormously abundant in the Sun: hydrogen is its most abundant component, and oxygen also is a major component. Although tiny in amount, traces of the water molecule have been reported in cooler parts of the Sun's atmosphere. Earth's solar system is believed to be about 4.6 billion years old, based in part on the age-dating of many chondrites . The Sun is slightly older. Comets, consisting of ice and grains of minerals and rocks—the "dirty snowballs" of astronomer Fred Whipple—are thought to be the oldest, least altered of any of the components of the solar system. They contain mainly water ice, but other icy components have been measured as well, such as carbon monoxide, carbon dioxide, sulfur, hydrogen sulfide, methane, and hydrogen cyanide. (The term "water ice" is not redundant because in space, some gases can change to ice on the surface of planetary bodies.) Comets may have rocky cores as well as interspersed grains of material. The interspersed granular character extends to comet tails, which form by ablation as comets approach the Sun and the ice heats up. These materials are minor components, however, compared to water ice. Comets thus account for a very significant fraction of water in the solar system: although small, there are many of them. The Oort Cloud of comets and the more recently described Kuiper Belt of comets account for untold numbers of comets and therefore comprise a huge reservoir of water. Many planetary scientists believe that cometary impacts early in Earth's history could have supplied much of the water for its oceans. Though small in amount compared to cometary water, meteoritic and asteroidal water is important in understanding water-rich Earth. Earth accumulated early in the history of the solar system by the sweeping up and accumulating of enormous amounts of debris as the early Earth orbited the Sun. These materials contributed their contained water to the growing Earth. As Earth grew, it evolved into a core, an intermediate mantle , and an external crust. Water played a critical part, especially through the process of melting of the mantle and crust, with resulting volcanism and other igneous activity. Owing to volcanism, water and other volatile components were expelled to the surface, forming, along with possibly significant additions of cometary water, Earth's hydrosphere . Meteorites fall to Earth continuously and are studied intensively for the information they provide about the earliest solar system and Earth. Until the return of rocks from the Moon, meteorites were the only known samples of extraterrestrial materials. Most meteorites are believed to come from the asteroid belt , which contains numerous rocky objects that orbit the Sun, mainly between the orbits of Mars and Jupiter. Some asteroids may have originated as comets, with icy exteriors that were vaporized by the Sun, leaving the rocky core. Meteorites and asteroids have been extensively studied for their chemical composition, including water. Carbonaceous chondrites, which are the most fundamental and least modified type of meteorites, and are chemically most like the composition of the Sun, have several percent of water, primarily chemically combined in their mineral structures. The amount of contained water may decrease or increase as meteorites are altered, such as through metamorphism , melting, or weathering or impacts. SEE ALSO Astrobiology: Water and the Potential for Extraterrestrial Life ; Earth: The Water Planet ; Earth's Interior, Water in the ; Mars, Water on ; Solar System, Water in the ; Volcanoes and Water . Chaisson, Eric J. Astronomy. 2nd ed. Upper Saddle River, NJ: Prentice Hall, 1997. Where water is found on Earth, life is also found, even in the most extreme physical and chemical environments. Although there is no direct evidence that life was transported to Earth by way of comets or meteorites, cometary and meteoritic transport certainly delivered the components required for the development of life: water and organic (carbon-containing) compounds. The most common surficial features of most planets and moons are impact craters, so water and organic compounds also have been transported to all other solar system bodies via the impacts of comets and asteroids. Where heat or other sources of energy exist, along with water and organic compounds, the potential for the development of life is high. OK, but WHY there is so much water in the Oort Cloud? Why so much water at the border of Solar System? Which mechanism created it?